Have you found yourself with a property full of things you don’t want or need? Before you start heading for the garbage can, remember: what you think is trash might be another person’s treasure! Our successful and experienced partners can help you with pricing your items, displaying your items, and/or disposing of items you no longer want or need. While holding your own yard sale or garage sale might seem like a good idea, it could end up costing you more than going through a professional agency. Do you truly know the value of your items? Do you know how much time is involved organizing, pricing and setting up a garage sale? Working with a professional who knows an item’s actual value can bring in more than you might think! You could very well sell an item for far less than it is worth. When you go to a store, you may notice that like items are always displayed together. Even though you can mimic this approach, only a true professional will know how to display your items to sell. Using time-tested techniques and knowledge, a professional can stage your items in an appealing manner, bringing more attention from potential buyers. Even though we all hope every single item will sell, the truth is that some items might not go to new homes. A professional will know how to properly dispose of items for you, saving you the hassle of having to do it yourself. It also might be easier for them to help you decide on which items you want to keep and which to discard, instead of having to do it all yourself. 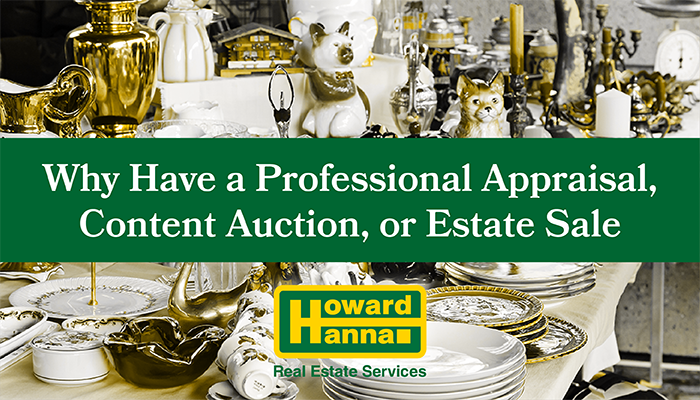 Holding an estate sale or an auction and getting your items appraised doesn’t have to be difficult. Howard Hanna’s preferred vendors are experts in their fields and are ready to help you with anything you might need!